Who would YOU like to have tea with, if you could pick any person, living or dead? There is one person I’ve been longing to meet, and it’s not possible for me to meet him in person in this life — not now anyway, as he died before I was aware of his existence. 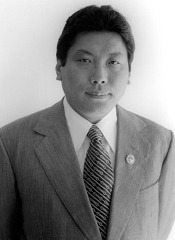 It’s Chögyam Trungpa Rinpoche. Thankfully, he IS available through video teachings on YouTube, and through his wonderful books. But is he available via tarot? Out of respect for Trungpa Rinpoche’s vision of warriorship, I have invited him to tea using the Samurai Tarot (one of my favorite decks and a deck that is full of deep wisdom). Let’s see what he has to say. And let’s see if I can come up with the right questions to ask! Let me just note that I have never, ever tried to reach someone through tarot in this way before. But I feel that if there is anyone out there who can be reached in this way — and who it would be utterly safe to meet in this way — it would be a living buddha (okay, or a dead one). These are the questions that I asked, and these are the cards that I drew. You can decide for yourself whether or not you believe Trungpa Rinpoche answered me. What should I ask you? And if I did, what would be your answer? 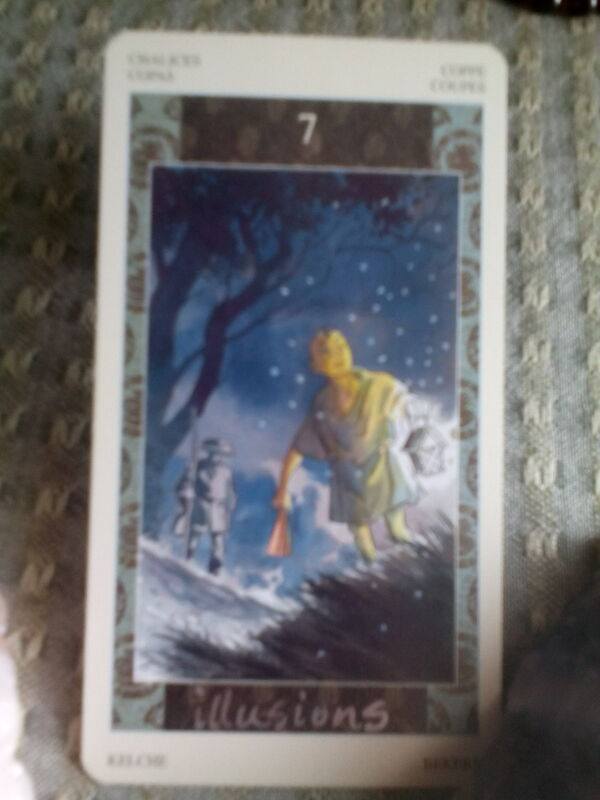 Interpretation: The Samurai Tarot associates the word Zen with the monk. Trungpa Rinpoche definitely appreciated Zen. But why the association with the Queen of Pentacles? 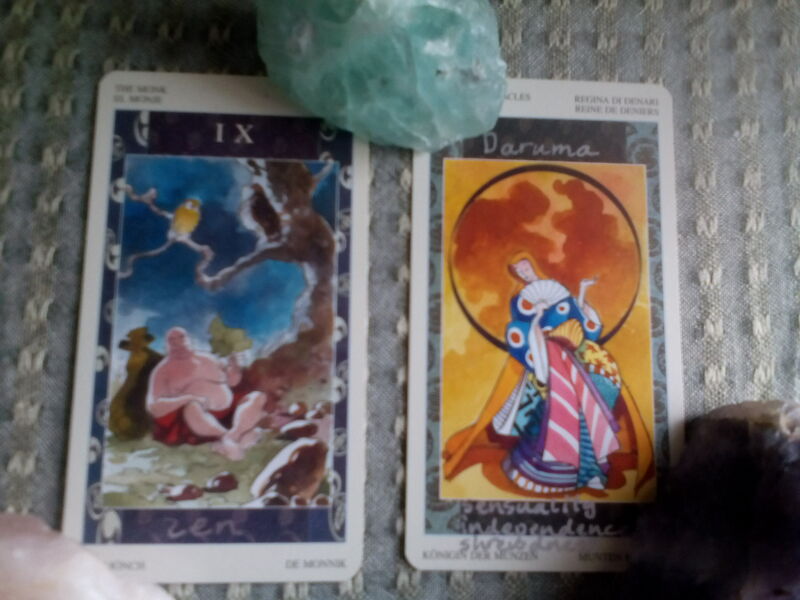 In the Samurai Tarot, the Queen of Pentacles is Daruma, and Daruma dolls are also called Dharma dolls. They are meant to represent Zen’s founder, Bodhidharma. There are many interesting things one could say about Bodhidharma! When he arrived in China from India, it’s said that he was met by a crowd of people who wanted to hear him speak. Instead he sat down and began meditating, meditated for hours, and then walked away without saying anything. Later, Bodhidharma went into a cave behind the Shaolin Temple, and meditated there for nine years. Eventually the Shaolin monks convinced him to come and live in a room they had prepared for him at the temple, and he came, sat down in the room, and immediately began meditating — which he continued to do nonstop for another four years. There is more to this story — a lot more — but I feel that Trungpa Rinpoche’s message here, from beyond the grave, even, is that I should ask about meditation, and that his answer would be meditation, meditation, and more meditation! I feel that my teachers come from more than one tradition, not just Buddhism, and that even the trees and rocks and the Earth itself are my teachers. What would you like to say to me about this? Interpretation: I know very little about Shoki. The Samurai Tarot tells us of his Goliardic cheerfulness! 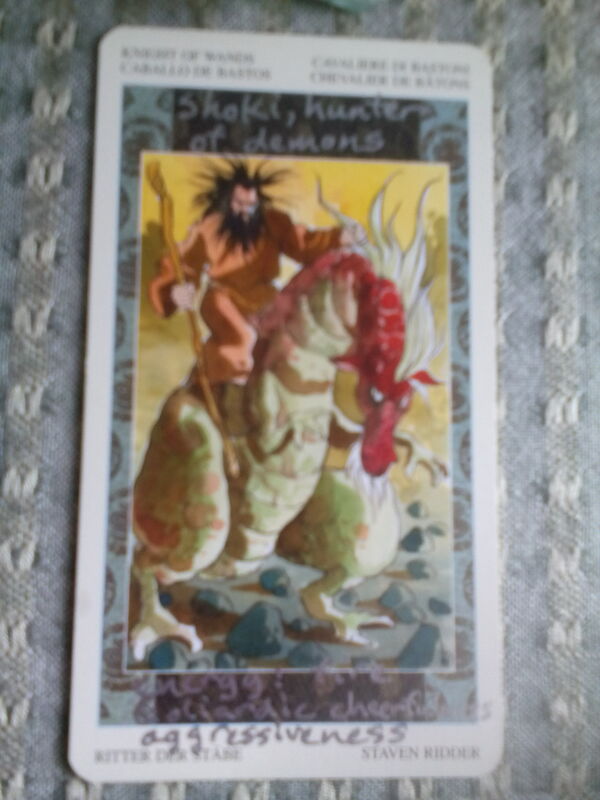 Shoki is a Chinese deity who protects against evil spirits and illness. I think Trungpa Rinpoche’s message here is to be careful who you learn from and who you accept as your teacher. Even though it is said that in some sense every other sentient being is our teacher, that is meant in a different sense from actually regarding those beings as your root teacher or teachers. I also see in this another possible interpretation, that there is a protection against evil that exists and is active, if one approaches one’s life work with a humble and pure heart. And that is something I actually believe. But it’s a dangerous thing to count on! In searching for information about Shoki, I found out a little more. It’s said that Shoki wanted to become a doctor, and scored very well on the national exam, but was denied the title of Doctor by the Emperor because of his ugliness, and that he then committed suicide, whereupon the Emperor had him posthumously given the title “Doctor of Zhongnanshan.” At that point, Shoki vowed, as a spirit, to protect the emperor and the empire from evil. Apparently many statues of Shoki can be seen above homes in Kyoto. I have become more and more convinced that spiritual actions affect the physical world (if there even is a difference between the two!). What is your view on this? Interpretation: Justice, to me, speaks of karma. The Samurai Tarot also associates it with inner divinity — or, I would argue, one’s inner buddha nature. But who is the Heron Maiden? The Heron Maiden is one of many folk tales that advises us to be kind to strangers — you never know who they might be! In this tale, a young man finds a wounded heron and nurses it back to health. Later, he falls in love and marries a beautiful young woman, a weaver, who tells her husband not to look at her when she is weaving. 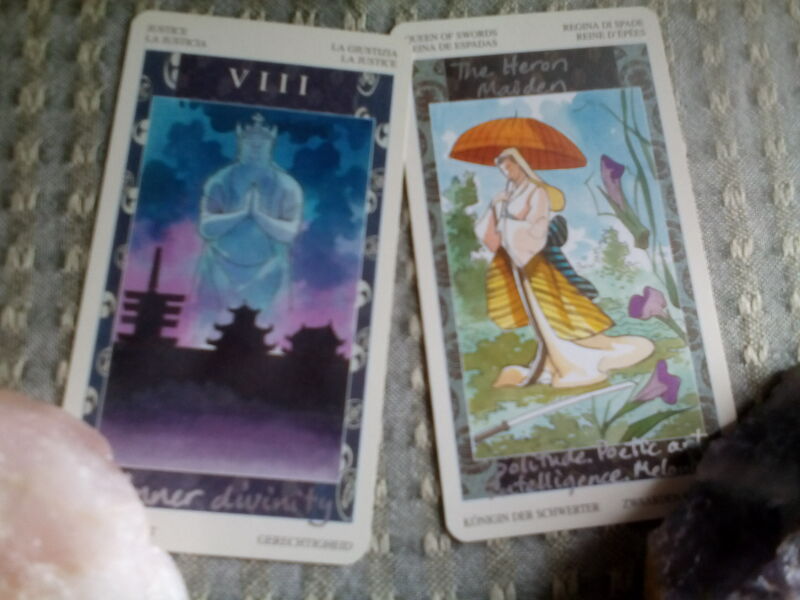 Of course, he does (that’s the way of all these tales) and he sees a heron at the loom (he sees the truth, and the Queen of Swords is also a card that is strongly associated with truth and honesty). She bids him a fond goodbye, and flies away. Do you see what these cards are getting at? We have met before in so many other lives. And we don’t, actually, know who the people are who we meet in this one. We don’t. We don’t know their back story, so to speak. We must treat other beings with kindness and gentleness — and compassion, kindness, and gentleness are the strands that weave together the spiritual and the physical world. We don’t behave gently for the sake of our own well being in either realm, but, when we are kind and gentle, we strengthen the fabric of goodness in the world. We help to weave a fabric that we can all depend on. Likewise, when we are truthful and honest, we strengthen this fabric. Dishonesty and violence, on the other hand, unravel the fabric, and that can cause tremendous problems. I have to ask: why all the wild partying that so many people associate with you? Just: why? Answer: Knave of Wands (the Soga Brothers). Interpretation: The story of the Soga Brothers is one of those classic, and utterly tragic, tales of murder and revenge. The Soga Brothers set out to kill the man who killed their father. 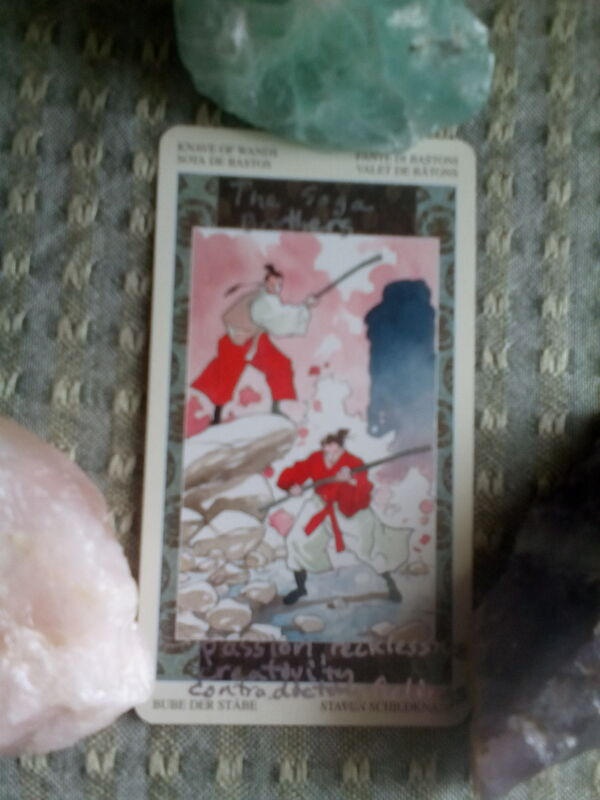 The Samurai Tarot associates this card with passion, recklessness, creativity, and contradictory feelings. I don’t want to comment at length on this question, even though I boldly asked about it. There is just a feeling of sadness about this card for me, and I think the answer, if anything, is that everyone is human — even a teacher can make mistakes. All the more reason to be careful what lessons one learns and what teachers one learns them from. Moreover, when we learn from a teacher, we still have the responsibility to think through our own actions and to behave responsibly. At the same time, the fact that someone did something that we may not personally respect, or may have committed acts that we regard as wrong, even, does not invalidate the good things that person may also have done or the excellence of the teachings that person put forward. Every aspect of the teachings, in my view, must be carefully considered and tested on one’s own — we would be foolish to simply accept what we are told, by anyone, without testing its validity for ourselves. If you could say something to us now, something meant for 2014, what would it be? Answer: Seven of Cups, Illusions. Interpretation: What can I say? Many things are not what we think they are. We are wandering around in the dark chasing fireflies. As if only the fireflies were real!! But what’s in the dark is real too, and of value, we just may not always see that. We could sit down (or walk) and enjoy the cool night air. Why not that? When we consider how much of what we see and experience is actually illusion, it should help to make us gentler and less aggressive. I don’t see how it could possibly fail to gentle us. What we think we know is true isn’t always so. Even the things we believe with 100% certainty don’t always turn out to be true, and don’t always turn out to be true all the time even when they are true some of the time. We have to be somewhat soft and pliable and allow ourselves to respond with genuineness to events as they unfold, without jumping to rigid assumptions based on the past. Being open to what is happening is not the same as being weak — it is simply being willing to look around calmly even in the absence of a firm ground underneath us. Is there anything you would like to say to me? 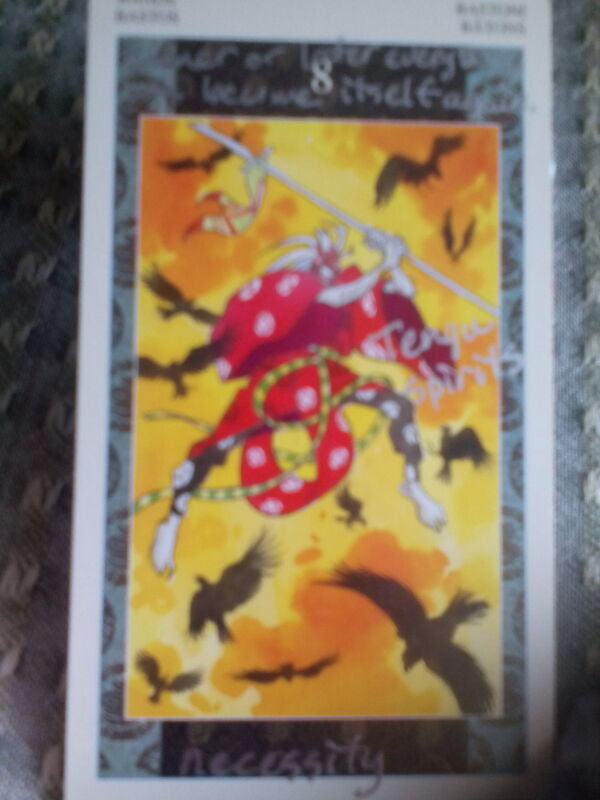 Answer: Eight of Wands, Tengu spirits, necessity. The Samurai Tarot says of this card, “Sooner or later, everything will become itself again.” Well, that’s reassuring! Yet I think there is more here, as well. Tengu are tricksters, like ravens in Native American stories. They can also take human form (which reminds me strongly of the story of the Heron Maiden, above). It’s said that Minamoto Yoshitsune learned martial arts from a tengu named Sojobo. So tengu can not only trick but also teach us. Goodin notes, as well, that tengu are famous for — well, the best term I can think of for this comes from Harry Potter — apparating and disapparating. They go about barefoot, not needing shoes to get from one place to another. Goodin makes a connection here with angels, and also with astral projection and dreams. To me, the Eight of Wands is also a card of moving fast, so it makes sense that the Samurai Tarot would depict this energy with tengu. Is Trungpa Rinpoche telling me that I need to start moving a little faster? Or that I need to not resist when things start to happen very quickly? Is he saying that if I insist on going barefoot (I generally do, or at least, my feet are bare in sandals) then I should learn how to fly? Or is he saying there is a necessity to see such things as tengu spirits and a necessity to accept the fast-moving flow of whatever may be appearing? I don’t know, but what’s coming into my mind is this thought: Time of is of the essence. Time, and flying beings…of all the cards in this reading, this is the one that puzzles me the most. Whew! After all that reading, I am SURE you are ready for another blog hop post. Please find your way to one using the links below. And please join me in a moment of gratitude for Trungpa Rinpoche and all his wisdom (whether or not you feel that wisdom is accurately represented here). 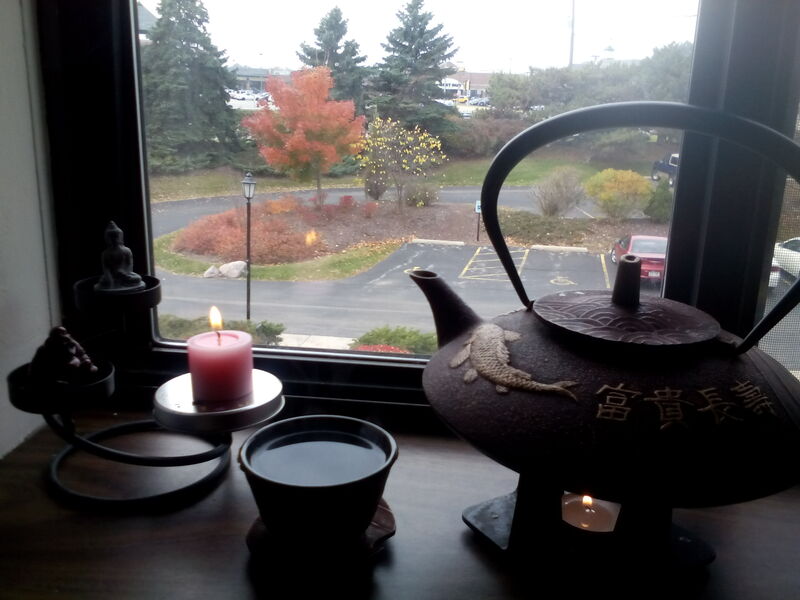 I earnestly hope he will come back and have tea with me again. Previous What Does It Mean When Wealth Appears in the Cards? Really thoughtful post, I enjoyed it! I like how you used the cards to ask the question as well as answer it. I didn’t know much about Chogyam Trungpa, so it was cool to become a bit more familiar with him. Thanks! I’m so glad you liked it. This was a grand experiment for me — I’ve never done this type of reading before. Thanks for the comment! I am so glad you liked it. So much to learn, so little time. Thanks for sharing about Shambhala this was a great reading, one that I will read again since this concept is new for me. Thank you so much! I’m very flattered that you would think this was worth a second read. Thank you. Love this post! So much storytelling I was gripped. Thank you!!! I’m so glad that you liked it. As I commented to sungoddesstarot, I was pretty nervous about this post — to be honest, I was worried that I might offend people by claiming to speak for Trungpa Rinpoche. But gave it my best shot anyway — I’m glad you liked it. I’ve never heard of this fellow, until this blog post, but it was you who inspired me to purchase the Samurai deck. I ought to use it, but I feel there is a lot of homework waiting for me in Japanese lore than I had originally thought!